A keystone species is one which is central to the functioning of the ecosystem as a whole. They are the ones that many other animals simply cannot do without. The entire ecosystem would unravel without them. In British Colombia, the Pacific Salmon are that keystone species. But, the number of these fish are steadily decreasing, dying mysteriously before they get a chance to lay their eggs… This feature-length documentary asks, why? Since 2009, corporate fish farms, placed along the wild salmon runways have been infecting the keystone species with ISA virus, a disease that’s creating ecological havoc. And the Canadian government is failing to act. Any day now, the first genetically modified animal ever to enter our food supply, AquaBounty salmon, could be approved by the Food and Drug Administration. This fish hasn’t been proven safe for humans. But the FDA may approve it based on a limited, flawed, and inadequate study — despite the fact that the same study identified elevated allergy-causing potential, and elevated levels of the IGF-1 growth hormone, which is linked to colon, prostate and breast cancers. 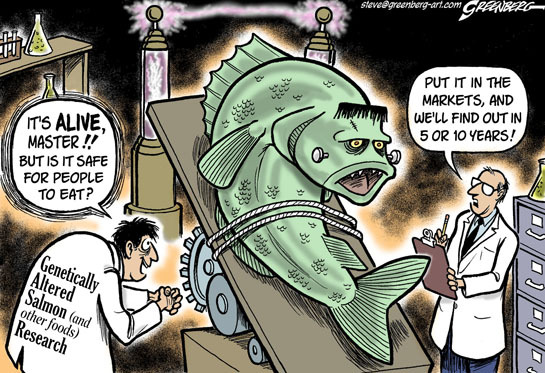 That’s why we’re encouraging readers to join Senator Jeff Merkley in a last-ditch effort to demand the FDA reject approval of GMO salmon. AquaBounty’s frankenfish is an Atlantic salmon, spliced with genes from an eel pout and growth hormone from a Chinook salmon. The result is a salmon that produces growth hormone year-round and grows twice as fast. Were GMO salmon to escape its farms into the wild, the fish would pose a serious risk to wild salmon populations. The GMO salmon consume five times more food than wild salmon, and are more aggressive. Introducing these traits into the wild population would be serious – and irreversible. Tell the FDA: Don’t approve GMO salmon.